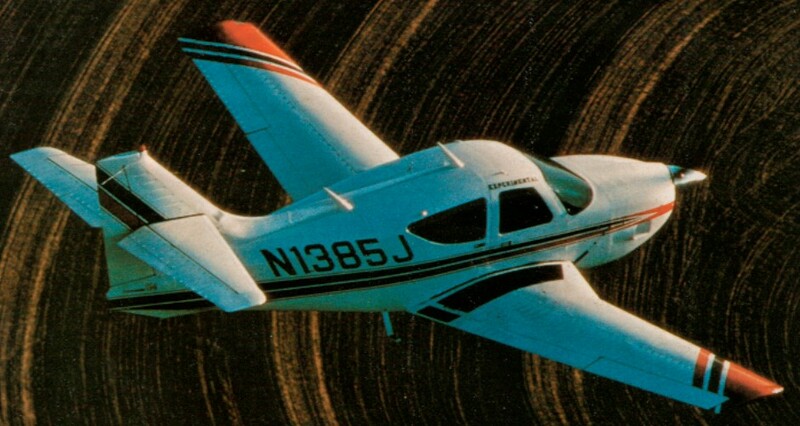 In its original conception, the 112 was to be a 120-mph fixed-gear airplane that could compete with the Cessna 172. As the decision was made to begin with a retractable and compete with Mooneys, Ar-rows and Sierras, a Rockwell survey showed that most pilots would give up a little speed for a really comfortable cabin that could be en-tered from either side. From this came the wide-body 112 se-ries. The single-engined Model 112 was delivered to customers from 1972. The airplane was not right in the beginning, when production glitches were numerous, so Rockwell recalled and modified the first batch of airplanes and moved pro-duction from the Albany, Georgia plant to Rockwell's Gen-eral Aviation Division plant in Bethany, Oklahoma, where their prop twins are made. The doors were part of the modification program of the original 112s. Original 112 doors were made of fiberglass and fitted so poorly that they shrieked in the wind and leaked in the rain. Metal doors, with plenty of latch points, cured that. (The metal doors were incorporat-ed on existing airplanes, at no cost to the cus-tomer.) The Bethany-built 112A is top quality. Rockwell offered two 112 deriva-tives, the 114 and the 112TC. The 114, powered by a fuel-injected 260-hp engine (compared with the 112's 200-hp engine) in the same four-place airframe as the 200-hp Model 112A, was first on the scene, beating the 112TC (with a turbocharged 210-hp Lycoming) to certification by at least a month. The 114's design goal appar-ently was to answer the most frequently voiced complaint about the 112A - the limited payload that resulted from powering a big airplane with a relatively small engine. The 114, with a 260-hp Lycoming engine, address this prob-lem; its useful load is 391 pounds greater than the 112’As and provides 10 percent more speed. The airplanes look almost exactly alike. The more powerful six-cylinder engine fited under the same cowl used for the four-cylinder 200. The top cowling comes off for access. The only visible differences between the 112A and the 114 are at the front of the cowling where a bulge is necessary to make room for the 114's alternator and where the prop governor pokes out. The bulge has a slot at its bottom to facilitate cooling the alternator. Only 26.5 pounds of structure were added, primarily in the area of the main-land-ing-gear attachments to absorb greater landing loads. The 112A has a maximum landing weight of 2,550 pounds, so the 114 can touch down with almost 600 pounds more. The tires and brakes on the 114 are a bit larger than on the 112A, too, and there are some small additional items in the tail cone. In total, the 114's standard empty weight is shown as 99 pounds higher than for the 112A. Rockwell also introduced a version of the 112A that, is powered by the Lycoming TO-360, which is essentially the 112A engine fitted with a fixed-waste-gate turbocharger. Its ability to produce a higher manifold pressure allows the engine to develop 210 hp up to nearly 14,000 feet. With that engine, the Rockwell 112TC-A can carry about 140 more pounds of payload than the 112A when both are filled with 399 pounds of fuel. The 112TC-A is equipped with auto boost; a throttle-controlled turbocharger. You boost the engine to maximum allowable simply by monitoring the manifold pressure gauge. The Commander 114B received certification in 1973 and is essentially a 112A with the 260hp engine. In the Magnum 300 Machen puts in the 300-hp version of the same 540-cubic-inch Lycoming six that, in derated form, powers the 114. A new, two-blade aluminum Hartzell or an optional three-blade Hoffmann prop of composite construction and the battery migrates to the very tip of the tail cone to redress the balance. A 25-pound optional soundproofing kit reduces cabin noise by seven decibels. The Machen Magnum's STC raises the gross weight to 3,000 pounds, with a zero -fuel weight of 2,580. The entire 420-pound fuel load can always be carried, but cabin load is limited to about 790 pounds. Machen was seeking an STC on two additional seats in the baggage space behind the rear seats, with a placard maximum of 200 pounds. The 300-hp Magnum 300’s performance includes ruising speeds at 75 percent in the 155-160 knot range at 6,500 feet, with fuel flows of around 15 or 16 USG per hour. With a usable fuel capacity of 68 gallons, the range at maximum cruise speed with a 45-minute reserve is about 550 nautical miles. Machen's scheme calls for a week of downtime to replace the owner's 200-hp IO-360, with five hours flying time for break-in and debugging. The bigger engine just fits in the standard cowling, part of the spinner disappearing into the front of the cowling. The optional Hoffrnann propeller ($1,000 more than the two-blade Hartzell) is of composite construction, the main part of the blade a fiberglass laminate to which is bonded a metal leading edge for abrasion re-sistance. A three -blade prop is quieter than two blades; but it does not produce more thrust. Range @ max cruise (45-min res., std. tanks): 765 nm. Engine: Lycoming TO-360-C1A6D, 210 hp. Engine: Lycoming IO-540-T4A5D, 260 hp.